Five weeks in a coma and twenty-nine surgeries later, Colleen survived. Rather than let the trauma and PTSD control her life, she became determined to find a way to make something positive from her pain. She decided she'd run again and dedicate her race medals to the everyday heroes around us, including the medical staff and blood donors who saved her life. Since then Colleen has run fifty races and completed forty triathlons, including four half-Ironman events. Now a spokesperson for the Red Cross, Colleen shares her incredible inspirational story to encourage others to take that first step forward. Colleen Kelly Alexander is a lifelong athlete and motivational speaker. 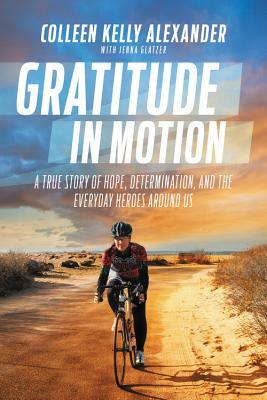 With her indomitable spirit and amazing story of survival, Colleen teaches others how to aim higher, be stronger, and use adversity as a catalyst to make themselves and the world better. She was the executive director of the Common Ground Youth Center in Vermont for eight years, and a regional program manager for PeaceJam, where Nobel Peace Prize laureates mentor youth. She has also worked for, volunteered for, and is heavily involved with the Red Cross. She lives in a New England coastal town with her husband and their three dogs and cat. Jenna Glatzer (www.jennaglatzer.com) is the author or ghost-writer of twenty-nine books, including Celine Dion's authorized biography and The Marilyn Monroe Treasures. She and her daughter live in New York.